Above: Story Laurie groovin' in the garden. Laurie McIntosh didn’t mean to become a musician. The Andes-based artist (full disclosure: she is a Watershed Post advertiser), began her career as a storyteller, spinning tales for kids at schools and libraries around the region. But soon, a guitar and her trademark strong, clear vocals crept into McIntosh’s storytelling repertoire. Now McIntosh is less Mother Goose and more “modern-day troubadour” -- each tale she tells comes with a melody. The garden theme is a nod to one of McIntosh’s passions: sustainable living, especially in the eating department. As a gardener and a mom herself, McIntosh believes that the answer to society’s woes involves a patch of dirt and a bunch of kids with seeds and shovels. The Watershed Post chatted with McIntosh this week about gardening, grooving, and her favorite vegetables. Q: This is your first solo album, but you’ve been singing and playing for years. What took you so long? A: For so long, I wasn’t sure: Do I go with a storytelling CD at first? Because I started out as a performer, and initially I felt compelled to do a storytelling CD. Which seemed, oddly, much more challenging, I think because much of my storytelling is visual, and I feared that much of it would be lost in an audio recording. And I love to sing, and I wanted to expand that part of my career. Q: Is this CD a departure from storytelling? A: I wouldn't call it a departure. I think it goes hand-in-hand with what I do as a storyteller. In my performances as a storyteller, I always sing. It may sound crazy to say I'm not looking for this to launch me into a different universe career-wise, but it's true. Mostly, I want to keep on the same career track, because I really love the work I do of going into schools and directly engaging kids in the creative process. And if the songs the kids and I write are about people coming together in their community to plant gardens and grown their own food: sweet! That is my dream job -- doing that work with kids. A: I was hoping that the CD would be about food and gardens, and wanting to promote that part of my agenda, my mission. Q: You have an agenda? A: My passion to trying to get people to grow sustainable communities. I’ve long been in the food and garden thing, singing songs and telling tales, and now a lot of these places are doing it. I wanted this CD to support that with songs like “Homegrown Tomatoes” and “The Apple Tree and the Bee” and “Strawberry Picking” and “Wonderful Wiggly Worms.” I thought, “'Groovin’ in the Garden,' that would be a great CD name." Once I had the title, I sat with it for a few days, and it dawned on me that I needed to have a title track for the title of the CD. I had one day left to record, and with that good pressure on -- which seems to be the way I function -- I cranked this tune out. And now it’s one of my favorite songs. When you listen to "Groovin' in the Garden,” you'll hear that dream expressed -- that neighbors are "planting seeds of community and singing a mighty song." And if the song sounds incomplete, like maybe it needs another verse or two, in part that's because I finished writing it at the last possible second, but it's also because I want communities to write that last verse for themselves, and tell the story of how they're working together to grow their community. If I do have any "agenda,” that's what it is. Q: The CD has a bunch of classic songs as well as your original work. Tell me about them. A: There are a couple of oldies but goodies. Thanks to Dean Jones, the traditional fare is done with a new twist. There’s “The Animal Song,” that traditional song from Michigan that a lot of people will think of as a Seeger Family song, there’s “The Hokey Pokey,” “Five Little Monkeys,” and “The Alphabet Song,” which is done in French, Cajun style. Q: Another original song is “Sandcakes,” which is apparently a true story? A: That started writing itself the first year that our family visited the island of Cayo Costa off the west coast of Florida. The night we happened to arrive to camp there it turned out that there was a total lunar eclipse. And then we woke up the next morning, and right from our sleeping bags, we saw an osprey eating a fish in a tree outside our tent. Everything in the song happened to us there, including the chorus, which is about sandcakes. I tend to make pancakes in my cast-iron grill, and they turn into sandcakes. Q: Last question: What’s your favorite vegetable? Saturday, December 3rd, 10:30 a.m., Woodstock Library -- CD Release! One-hour Story Laurie family concert, featuring some of Laurie’s favorite tales, and a heap of songs from the CD, of course! Free admission. Saturday, December 3rd, 6:30 pm, Bovina Community Hall -- Story Laurie joins Hilton & Stella Kelly in providing musical entertainment for Farming Bovina’s “Harvest Dinner” to benefit the Bovina Public Library. The dinner runs from 5-8pm. Saturday, December 10th, 6-9 pm, Cabaradio Live! 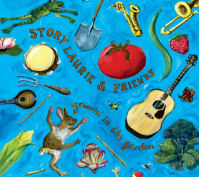 at the Pine Hill Community Center (and airing on WIOX Radio 91.3 FM) -- As one of the evening's musical guests, Story Laurie will share some songs from the new CD. Saturday, December 31st -- First Night Oneonta.